A refuge to go and take a break from the intensity of daily life and be fulfilled, this is the purpose that Windhover Contemplative Center in California, United States will have. Although its construction has been on the Stanford University’s agenda for about 15 years, only this year the project received the final approval in June for both design approval and site, and it’s scheduled to be finished in spring 2014. Adjacent to the Papua New Guinea Sculpture Garden at the corner of Santa Teresa Street and Lomita Mall, the new Windhover Contemplative Center will be a spiritual retreat, a one-storey, 4,000 sq ft space that will inspire and promote personal renaissance where university’s community (staff members, students and faculty) will be able to reflect on themselves quietly in the daytime. The chapel-like center will be built in the front of Roble Hall, neighboring to a natural oak grove, where now is a parking lot. The idea of making such a place belongs to the late Nathan Oliveira, an internationally acclaimed artist who was Stanford art Professor for three decades. The art Professor wanted that people have a center to re-establish balance and find tranquility while viewing his large paintings inspired by birds in flight. 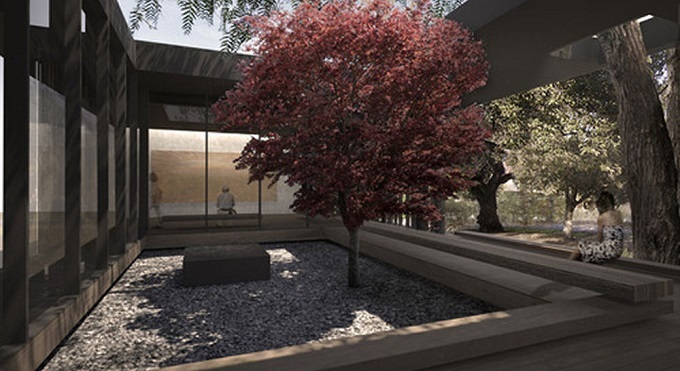 San Francisco-based firm Aidlin Darling Design teamed up with Andrea Cochran Landscape Architecture to design this $4.2 million center showcasing a building enclosed in glass in order to let people contemplate the Oliveira’s paintings even from outside anytime. Before entering the refuge, there’s a long, private garden sheltered from its surroundings by a line of tall bamboo. The exterior landscaping will have garden areas, fountains and reflection pool which will ensure ambient sound as an aid for meditation. Inside the building, there are three rooms where one can see five large paintings belonging as we said to Professor Nathan Oliveira. Rammed earth walls, wood surfaces, benches and cushions along with the outdoor design guarantee the visitor a great visually, olifactorily, tactily and acoustically experience. What do you think about this place?